At Amanda Lee Weddings, we value our brides and understand the search for the gown of your dreams. We also believe that quality and individuality are not mutually exclusive, and neither should they be limited by a price tag. 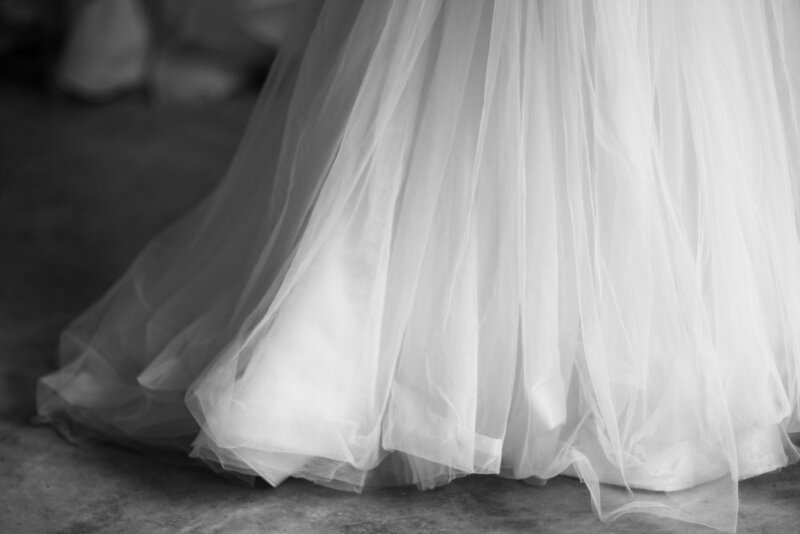 read on to find out how we can help you find the perfect gown for your big day. "Will this look good on me?" "What if I change my mind about the design I've come up with?" "Do I have enough time to get the right dress?" "I want this, but is it within my budget?" "Is this made for me?" If the above sound familiar to you, get to know us and our craft. We offer unique gowns off-the-rack, while keeping it exclusive for you. How do you decide if you should go for an off-the-rack gown? It can be stressful trying to piece your gown together from scratch. Gown shopping should always be fuss-free. Being experimental can be fun, but not if you have little to no clue on what style you like, or what silhouette suits you best. Our designers discover that with you, by getting you started on trying our off-the-rack pieces. When you find what you like, that's when the fun starts! Leave the rest to us. Since the gowns are already made, all that's left is making sure they fit right and embody your personality. An off-the-rack gown takes about a month for alterations and personalised adjustments for it to be ready. On the other hand, gowns that are made to measure take at least 6 months to be ready - from designing to fittings, to your wedding day. If you've got a tighter budget, but still want something exclusively yours. Here at Amanda Lee Weddings, we're all about making your experience as a bride special. We make sure that our off-the-rack gowns become uniquely yours through fittings and discussions on how we can personalise your gown, as if it were made just for you. We believe brides should wear the gown, not the other way around. If you'd like to pick up something off-the-rack, here's what you should know about us. At Amanda Lee Weddings, we constantly create. Our off-the-rack gowns are unique, and only come in one piece per design. New collections are released quarterly to keep our off-the-rack gowns fresh and alluring. Once a bride has confirmed her gowns, they are safely kept for her till her big day. It's our little way of making all our brides feel special, even with an off-the-rack gown. It isn't the right gown if it doesn't fit you right. and our off-the-rack gowns are no exception. Lynette in one of our illusion top gowns. Photo by Said & Meant. Joan looking ethereal in one of our off-the-rack illusion lace top gown. Photo by Multifolds Photography. An Amanda Lee Wedding gown brings out your best and helps you be confident in your own skin, giving you that extra oomph and grace as you walk down the aisle to your happily ever after. The perfect gown is one with the most comfortable length for you. A bride should never settle for a gown that requires you to lift its front as you go about your wedding day. We make sure our off-the-rack pieces are tailored to the right length for you, so that you'll walk in it with ease, yet still feel like a princess. Our bride, Lisha, stunned with a tulle train as she scaled Iceland for her pre-wedding photoshoot. We work with our brides to craft the perfect gown for you. Featured here is a semi-translucent tulle train for the added drama as you walk down the aisle. For a banquet dinner stunner, our bride, Zhixin sported a two-piece Cinderella-inspired ballgown specially tailored to her height and comfort. Photo by Multifolds Photography. No gown is complete without finishing touches personalised for you. At Amanda Lee Weddings, our designers aren't salespeople. We work alongside with you to find and create a gown that you are happy with. Featured here is an illusion top with lace bodice on one of our off-the-rack pieces. Feel free to let us know what you love, and our designers will be more than happy to pick out dresses that compliment your silhouette and style. Whether you're going for bold elegance or regal beauty, we believe in customising your gown with details that make it true to your personality. Our bride, Annamae in an Amanda Lee Wedding gown. Photo taken by Androids In Boots. To begin your wedding journey with us, feel free to make an appointment with us here. We hope to meet you soon!